Speer Law Enforcement (LE), under the parent company Vista Outdoors which also owns Federal ammunition, Savage Firearms, and a few other major players in the industry. It is a well documented pedigree of quality which has been relied on by scores of agencies across the nation. 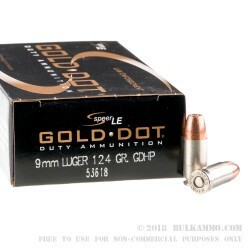 Speer's Gold Dot JHP 9x19 ammo is a standard self-defense round that's earned the attention and respect of both civilian gun-owners and law enforcement agencies all over the world. 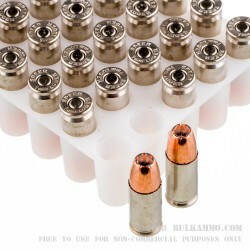 The 124 grain jacketed hollow point is one of three weights more or less standard in 9mm loads, those being 115 grain, 124 grains, and 147 grains. The 115 grain loads are very fast but lack mass. 147 grain projectiles have the mass which shooters like, but the energy and velocity drop significantly in 147 grain loads. 124 grain hollow points seem to be the best marriage of mass with velocity and energy in this caliber. Speer’s Gold Dot LE is designed for maximum weight retention while penetrating a broad array of materials which could commonly be encountered in the field. 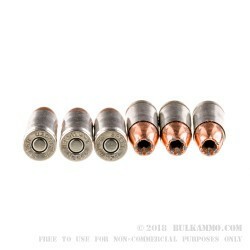 Their 124 grain in 9mm advertise 1,150 fps at the muzzle with 364 ft/lbs of energy, dropping to 1,089 f/ps at 25 yards with 326 ft/lbs of energy. 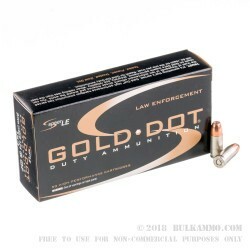 If you are the purchasing officer for your agency, or just want to keep an edge up on whoever might pose a threat, then buying your Speer Gold Dot LE in bulk is the best option for your needs. Grab up some of this good stuff now before it is all gone.